Platform Tennis is a racquet sport similar to tennis (from which it is derived) that was invented in the 1920s by Fessenden Blanchard and James Cogswell in New York who decided that they wanted an alternative to tennis that they could play in the winter. Played on a raised platform that allows for heating equipment to be placed under the court, along with the presence of lighting it allows the sport to be played outdoors all year round. Unlike Tennis which has both singles and doubles versions, the game is played solely as a doubles game. There is no world association for Platform Tennis but there are many national organisations across the globe such as the American Platform Tennis Association. The object of Platform Tennis is for one pair to defeat their opponents by winning two out of the three sets that make up a Platform Tennis match. 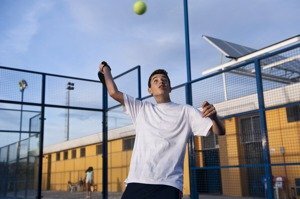 As a game that is played in pairs, it requires a great deal of cooperation and understanding, especially as the game is played on an enclosed court that is a great deal smaller than a regular tennis court. Because of the small size of the court and the fact that balls can be hit off the sides in a style akin to squash, it means that players need to have good levels of fitness to be competitive. Platform Tennis is played in pairs on a court that measures 44 feet long by 20 feet wide, with markings that are exactly the same as a regular tennis court. A net goes across the middle of the court that is 34” in height and a 12-foot tall-galvanized fence surrounds the court. Unlike tennis which uses a racquet, in Platform Tennis players use a paddle that is 18” in length and is made of graphite and titanium. With no strings, it has holes cut in the face that not only helps to manoeuvre the paddle but also helps to add bite when hitting the ball. The balls used are in Platform Tennis are very similar to tennis balls and are usually made by Viking or Wilson. The only other recommended pieces of equipment for players of Platform Tennis are a good pair of tennis shoes. They are the receiving team and the ball is allowed to bounce twice. A player returns the ball and it lands outside of the baseline or sidelines or hits the net or any other object. A player hits the ball before it has completely passed over the net to their side. A player catches or handles the ball deliberately. The ball when in play touches any part of a player. A player hits the ball out of play, hits an object outside the court and then rebounds back into the court. A player throws their paddle at the ball and hits it. When points are won, they go up as follows: 15, 30, 40 and then game. If the score of the game becomes tied on 40-40, then deuce is called and the winner is the first team to score two points in a row. To win a game of Platform Tennis, players need to work as a team to win as many games as they can. Winning six games in a set wins them the set, and doing this twice means that they have won the game. Before commencement of the game, a spin of the paddle is performed, with the winner getting to decide whether to serve first or receive first or which end they wish to start at. The two teams then take their places on opposite sides of the net, with one member of the serving team being the sever. The server must serve the ball from a position that is behind the baseline and in between the sideline and the centre mark of the court, so that they are diagonally across from the receiver. The receiver may stand wherever they like, as can the other members of both teams. Serves shall alternate from behind the deuce court and then from behind the ad court. Serves must pass over the net and bounce before the receiver is entitled to return it. A return volley on the service is not allowed. Only one service is allowed. If a server faults the service, then they lose the point. Once the ball is served, it remains in play until the point is decided, there is a fault or a let is called. Scores are 15, 30, 40 and then game. If the game reaches 40 - 40, then further points are played until one team manages to win two points in a row. The first team to win 6 games wins the set. The first team to win 2 sets wins the match.